Editor’s Note: Probably some of the most interesting series of articles on the current status of the newsstand industry and it’s future have come from publishing consultant and “Folio Magazine” contributor Linda Ruth. Linda is a veteran of the newsstand industry and has successfully added the digital realm of the publishing world to her portfolio. That’s a model I am striving to follow. Recently she’s published some articles on what the newsstand world’s “Plan B” could look like. This week’s article, included some interesting “reveals” from former Buffalo, NY wholesaler Larry Scheur. 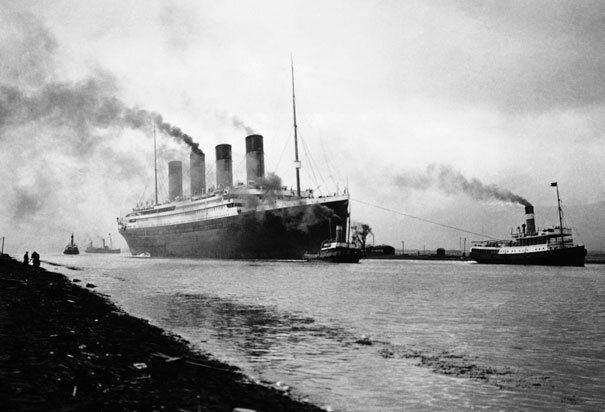 It was then picked up and re-posted by industry guru Bob Sacks. It’s sparked much reaction. What I have written below is my response to some comments, calls and emails directed my way. I suggest you read Linda’s article to get the gist of what I am trying to say. I never called on Larry Scheur in Buffalo and don’t know him personally. However, I do know him by reputation and I respect him for his creation of the “Buffalo System.” I’ve seen it in action in several forms and it was, in my opinion, one of the better single entry systems in use. Moreover, I do know many people who did call on his Buffalo and Jamestown, NY warehouses and they reported that the operations were well run. But since the publication of this article, I’ve received a decent sized flow of “See, I told you they were all corrupt!” and a “Pox on all their houses!” comments so some sort of response seems appropriate. Yes, some magazine wholesalers did try to screw around with their systems. One of the reasons we know about them is because they were called out at some point and compelled to pony up and correct their ways. There’s a reason national distributors have auditors. From my experience, most of what these auditors catch are honest mistakes in the system. Hell, I still have to correct people I meet who have heard some version of the “Phony Book Cover” returns story. The one is what, at least forty years old? It was a hoary old chestnut back when I walked into the business and there have always been multiple versions of that story. Even science fiction author Ben Bova includes a version of it in his prescient novel Cyberbooks. Yes, many wholesalers may have made a portion of their total profit from delivery fees charged to retailers. They may have even made money from overages, shortages and the like. From my experience, however, it really depended on the wholesaler, the market that was serviced, and their individual corporate culture. If you traveled around and called on as many US and Canadian based wholesalers as I did back in the day, you got pretty good at figuring out who worked hard, who was clean, who was good at merchandising, who put interesting and effective ideas into action, and who made money in spite of themselves. Were there concerns about cheating? Mostly they were about things falling off of the back of a delivery truck and into the hands of the local “Friendly Neighborhood Bootlegger”. Did some wholesalers play with the float on returns crediting with their retailers? We heard that often enough. There is conjecture that it may be one of the numerous reasons the big national chains put the business up for bid. However, I’ve never had a retailer say that to me. But all in all, this was, and still is, a straightforward business. You take stuff in, you put it out. It either sells, or it doesn’t. If you screw around with your privileges, you’ll either be caught and forced to pay up, or you will gain a reputation and no one will trust you. 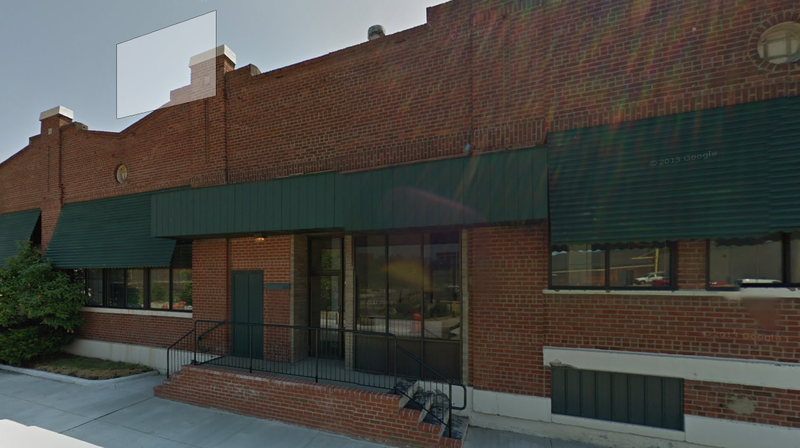 The former Interstate Periodicals. Madison, WI (And one of my favorite cities and wholesalers to visit). As for O&R “over regulating” the business. I think that is a fascinating comment from someone who had a hand in developing the order regulation system (Although I always thought the first system to market was the DataMan system). Does he regret it? The big problem with order regulation is that the sell throughs and sell through targets mean different things to different links in the chain. A 30% sell through may break even or even make money for a publisher. It may be a loser for the wholesaler. Both the retailer and the national distributor make money on everything that’s sold. Finally, with regards to the story about the national distributor offering “skiffs” to Larry. Who am I to dispute his story? He did the right thing by leaving and the “well-respected” VP was in the wrong. Were similar offers made to other wholesalers? Maybe. Most likely, I would surmise. But that is my opinion. Show me some other business in or outside of the publishing world where everything is clean, tidy, shiny and perfectly honest and I’ll show you some Sunday morning pontificator on cable TV bloviating about something he knows nothing about. From my experience, most “deals” between ND’s and wholesalers involved fees and payments for additional distribution and dealer adds. Occasionally additional discounts would be offered in lieu of fees. This was a successful way to launch a new title or the relaunch of a stagnant veteran. I have to confess that I did that myself more than a few times at the behest of publishers I worked for. If I have any fear, it is that this article will be remembered not for Larry’s discussion of ideas on how to fix things, which is worthwhile. Rather, it will be used to confirm the “publics’” worst fears about a broken business model that is in dire need of repair. 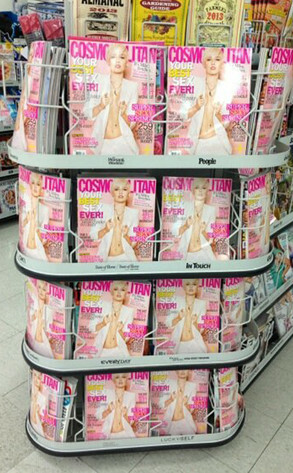 Did Miley Cyrus Save The Newsstand? Let me just say that one more time: 11 million fans (Currently 11.9 million fans). From: Allieiswired.com. I wonder who bought the Feature Checkout spot on that rack? There was a decent amount of coverage in both fanzines and publishing related journals about her “takeover” of the newsstands. Of course, we covered it at the Foredeck because we believe that not everything has to be all doomy and gloomy all the time. 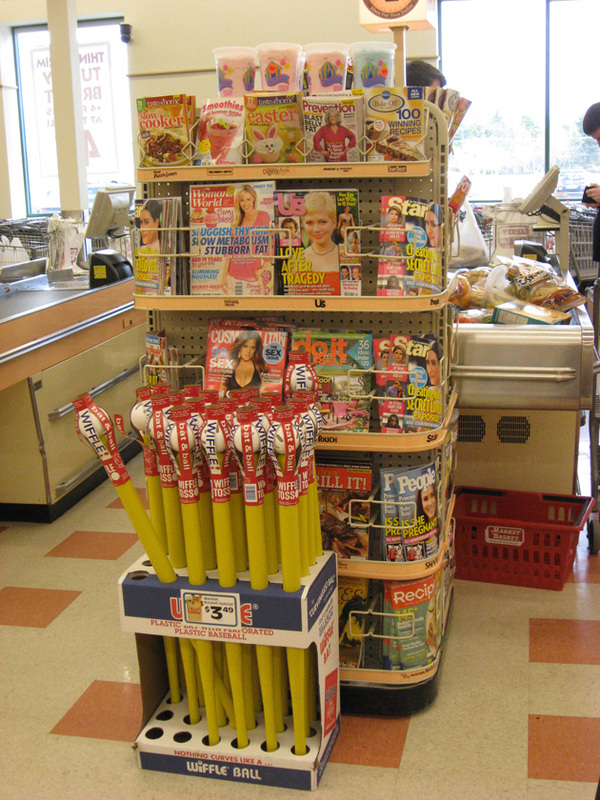 So the question now is: Did Miley Ray Cyrus actually save the newsstand? Or at least the March issue of Cosmopolitan Magazine? The March “Miley” issue sold about 7.5% more than the January issue within my sample. I’m sure the good people at Hearst already know the actual and more accurate results. 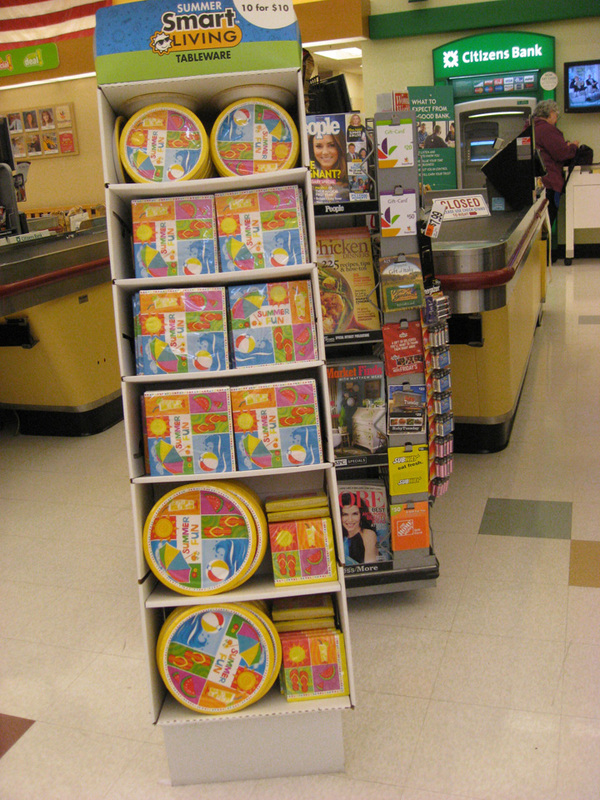 Social media and an active fan base can help newsstand sales in certain instances. Since the “Hannah Montana” show ended, Miley Cyrus has been more famous for her hair styles and tattoos than her music and acting. That’s not a knock on her. She clearly knows how to manage her “brand” and public image and she does a good job at it. Despite the lack of TV, movie and music exposure she has 11.9 million Twitter fans and 26 million Facebook “Likes”. More importantly she has people who will go out on their own time and do stuff for her. Like merchandise magazines. And buy them. You know, pay full, single copy price with US dollars for old fashioned media printed on wood pulp. In other words, what Mr. Magazine(tm) calls magazines. So imagine, even with a small niche magazine, what could happen if you merged an active fan base and a dedicated group a readers. Spend some time on Twitter or Facebook and scroll through the postings of any bookstore (chain or indy) or major retailer. Or many magazine publishers for that matter. On the publisher side, other than a few callouts that this or that issue is on sale and this is what the cover looks like, how much single copy promoting (or subscription promoting) is going on? How about the obvious place to promote single copy sales? Bookstores? Very little is going on. And I’ve never understand the reluctance. Are the social media and circulation silos still that hardened? How much effort or energy or even creativity does this take? If you’re going to drop some serious promotional dollars on a special issue, why wouldn’t you make note of it on your social media feeds? At least more than once on a Wednesday at 4PM? And why wouldn’t you get with your retail partners to promote that? If you are going to go through the time and energy to print hundreds of thousands of copies of your magazine, pay tens of thousands of dollars per issue to ship them, pay tens of thousands (or hundreds of thousands) of dollars to pay for premium display space, why on earth would you simply leave it to accident and chance that your audience just might, maybe, perhaps, possibly walk by a magazine rack and suddenly have an urge to buy your product? Why would you limit your audience to only people who occasionally browse a magazine rack? If anyone has some stories about their efforts with social media and single copy sales, please ping me and let me know what happened. I’d be happy to help you publicize your story. The good news is that our new Secrets of the Civil War got placement by checkout that we didn’t pay for. The bad news, of course, is that the retailer committed such assault and battery against its highly profitable magazine business that no shoppers will actually see our bookazine. More bad news: The title is not displayed on the store’s mainline. Encroachment at the front end has long been an issue for the publications that participate in check outs, with the encroachers enjoying the benefits and the “encroachees” left scrambling to defend their turf. “Things Placed In Front of The Magazine Rack” is part of an informal calculation I now consider when budgeting for check out programs. Although in this particular case, we’d have to argue that Mark’s “encroachee” title didn’t get much benefit because of the dump display of batteries. I wonder if there is an algorithm that would define this? Could it be turned into a charge back “Marketing Fee”? Who would have to pay the carrying and inventory costs? I’ll have to get the accounting department on that right away. In the meantime, Mark should know that I found Secrets of the Civil War on the mainline of my neighborhood supermarket and I thought it was a really good read (I bought a copy). 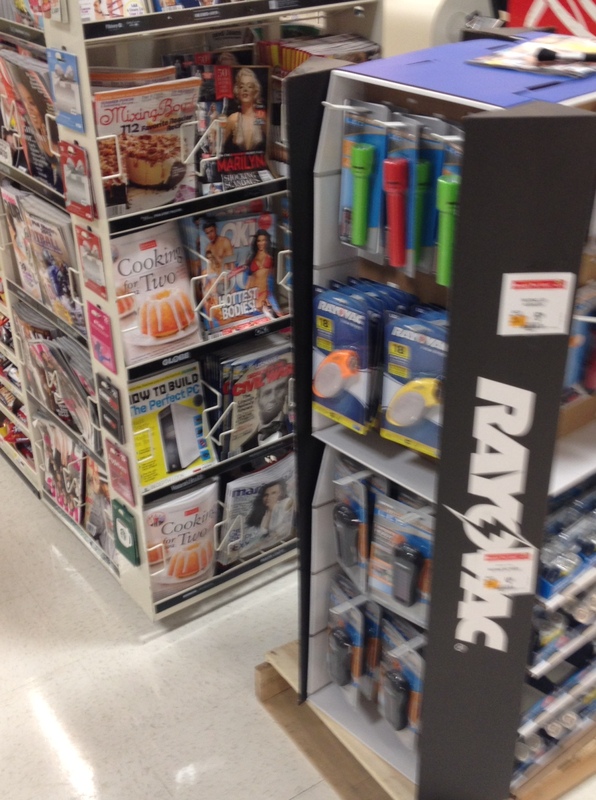 If you have a good example of “Things Placed in front of the Magazine Rack”, please forward them. Checkout, mainline, specialty rack, all are accepted and appreciated. No, I haven’t run out of things to write about. There is so much to discuss about the single copy business. Over the past few weeks I’ve received some some remarkably good material from correspondents around the country. It is nice to get these pictures and stories in a “I wish it wasn’t so” kind of way. It’s clear that my griping about things getting placed in front of magazine displays isn’t restricted to my little neck of the woods. But I guess I already knew that. 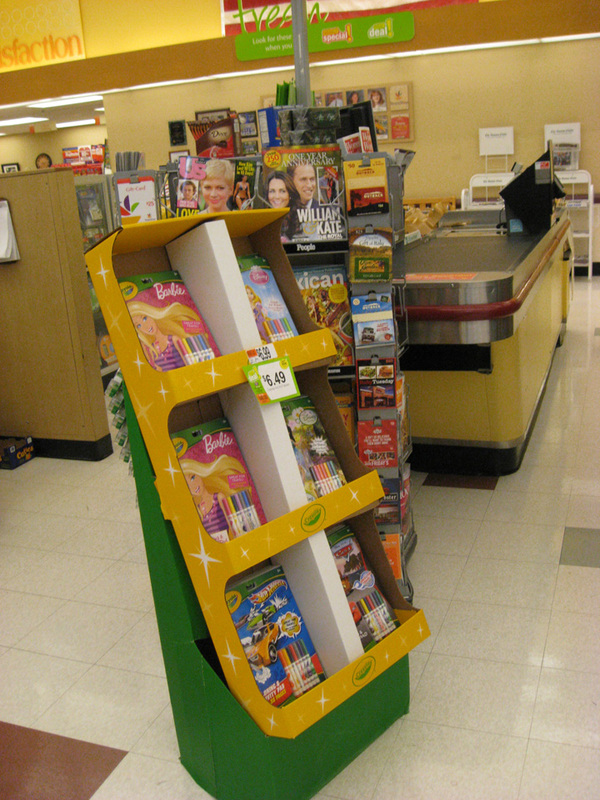 Consultant Linda Ruth of Publishers Single Copy Sales and Magazine Dojo was recently reviewing some magazine displays on behalf of one of her clients and sent along some of the things she witnessed. She also wrote a very engaging blog post on Magazine Dojo entitled, “Retail’s Failure to Honor Their Display Promise” and I encourage you to go and read it. 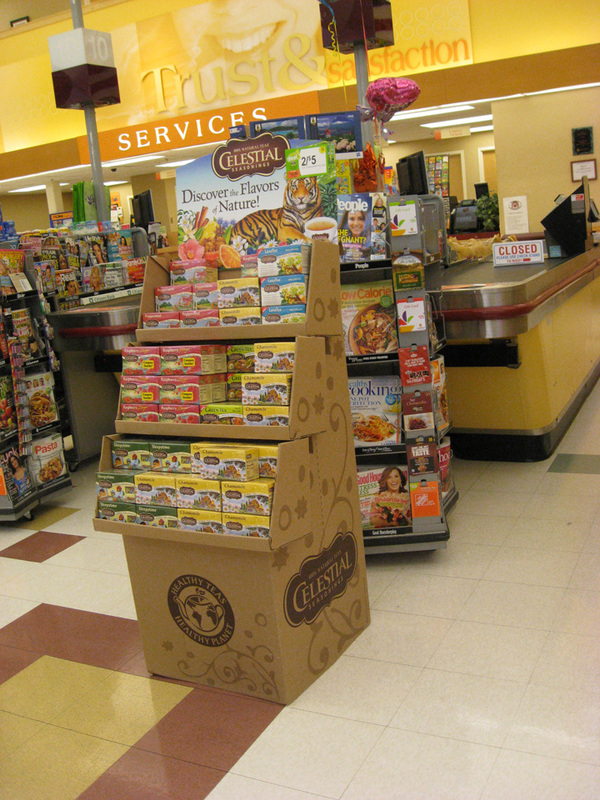 Part of the issue here is that store managers rightly have a lot of freedom to put displays where they see fit. They don’t have an enormous amount of room, magazines are at the front end, they’re already in pockets. For the most part store managers don’t have to worry about merchandising them and these one shot pre-packs need to go somewhere. So they go in front of the checkout. As Linda points out, when pre-packs get stuck in front of a mainline, it’s the price we mainline publisher’s pay for just paying our discount and RDA. But the checkout is another animal because publishers pay discount, plus RDA, plus the rack construction cost. More importantly, it’s a three year commitment. Barbies, wiffle balls and herbal teas are at best, a one week commitment. The recent developments in the industry, most notably the purchase of Comag by News Group, the investment of Hudson News into the deal are supposed to be a “watershed moment” where we will see the elimination of overlapping marketing and distribution activities and a smoothing of the waters in the distribution channel. From an accounting and staffing perspective, I get that. Having all kinds of junk dumped in front of checkout and mainline display space is nothing new – it’s been happening for years upon countless years. In the 21st century, though, it feels a little different. Magazines at retail are being challenged. Our distribution systems are fragile because there are so few avenues to market. All of them are stressed. Cost of entry has risen, not gone down. Clearly we’re not making our case well enough to the retailers. Do they feel an obligation to maintain the space that our publishers pay a premium for? Our wholesalers are supposed to merchandise. Clearly our wholesalers are under pressure to get the job done and facing enormous amounts of competition for the space they do manage. Years ago, the wholesalers used to maintain an industry trade group that tried to speak for them with one voice. Publishers and national distributors have IPDA, the MPA and the PBAA. There is a joint “Retail Conference”. Is it time for publishers, wholesalers and national distributors to try and speak for magazines with just one voice? Most of our disagreements are so much inside baseball. But the profitability of the product we represent is not up for argument. Want some reading material on your picnic? We need to do a better job engaging the retailer, checking up on our own distributions, and fighting for our space. How do we do this with circulation staffs and budgets that are shells of what they once were? Increased “efficiencies” of all types is a noble goal. But ours is a sales oriented business. How Close Are We to The Ice Pack?